RailGun Photos, Cross Florida 2014. Cross Florida 2015. 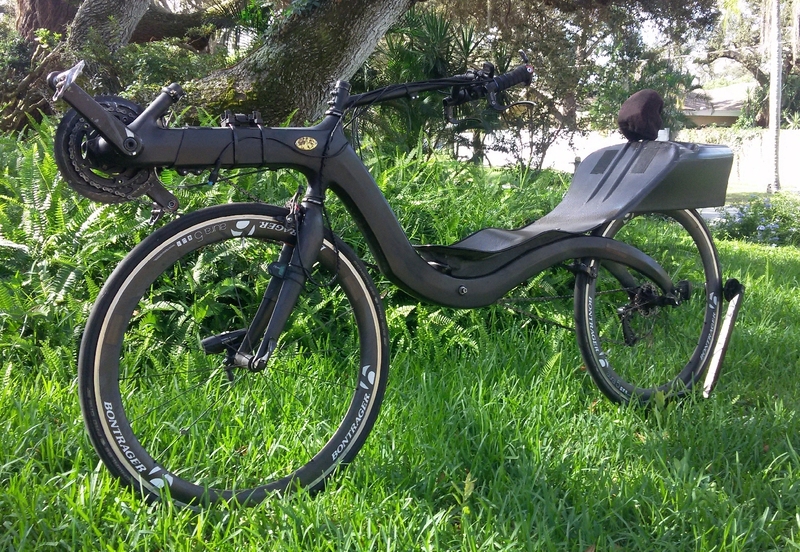 The pioneers of high-performance, low seat-angle seats on short wheelbase recumbents brought our famous carbon-fiber seat and tailbox to a new performance and usability level. We are seeing about a two mph increase in speed over the original RailGun at 30mph. The GT is intended for ultra distance events and speed-touring. It has around eight degrees of recline. When used properly, this seat should do away with the need for "bridging" when at high power as it more properly positions and supports your body by supporting the spine and pelvis so the the sacrum floats slightly off of the seatpan when under power to prevent hamstring irritation and damage often seen on other carbon seats. It doesn't flex in the middle of the seat as all other seats do, for much quicker acceleration, faster/easier climbing and better power transfer and is far more aerodynamic. The seat has integrated headrest tubes for a built-in headrest that weighs less than 6 ounces. It doesn't need a clamp but just slides in and out easily yet stays at your correct height. It is very flexible and can comfortably handle rough roads and most bumps without having to lift your head from the headrest. The tailbox has two integrated bottle holders that are located directly behind the seat and a hinged lid that opens backwards for holding essentials. While the GT tailbox is only slightly larger than the original, it has almost twice the usable space inside and is much stronger. for more information about our seats; how to pedal, climb and breathe; seat angles, tailboxes. etc. This RailGun seat follows the contour of the M5 CHR frame and is extremely stiff for fabulous power transfer yet a comfortable ride when under power. Accelerating, climbing and just running under power on this ride is so remarkable and fun it likely has to be experienced to be believed. By design, the tire interferes with the floor of the tailbox for an M5 CHR by almost three inches with the eight degree seat angle so we made a shaped tunnel insert to fit in the bottom of the tailbox to clear the wheel. Between the RailGun GT seat and the SpeedRail tube panniers, this M5/RailGun is a very, very fast bike. I can typically cruise at 23 mph with only about 150 watts. It managed to set a new 65-69 age 24-hr non-drafting record and the panniers work so well I would rather ride with them and their extra weight than not ride with them. We are still discussing the pannier design but it will likely be two-part panniers with the front part bonded to the seat which will receive a rear section which will also attach at the rear of the tailbox. All new RailGun GT seats will now be fully oven-cured. The above photo is of the first fully oven-cured RailGun seat. The seat is lighter and stronger. It weighs about 3 lbs total, with all mounting hardware and headrest (not including the panniers). 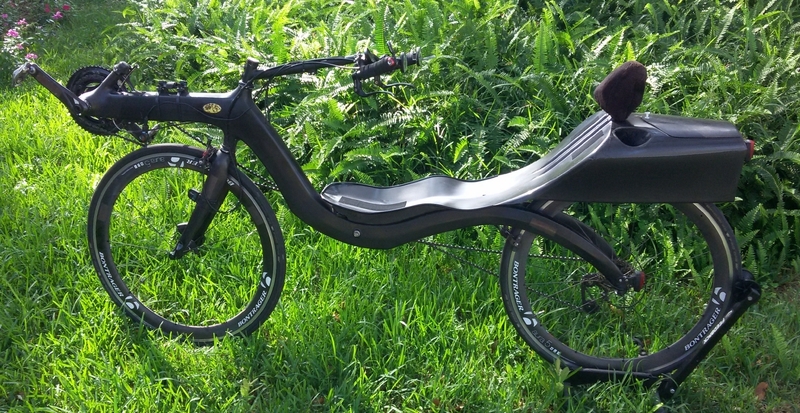 While we have many great testimonials from our RailGun riders, the GT seat surprised us a bit by reducing turbulence behind the seat so much that it creates a better draft at faster speeds than we expected. Our strongest drafting riders just love the new seat now so we thought we would include some of their testimonials this time, instead. "It is like drafting a VW minibus compared to the old one"
"It punches a huge hole in the air for me now"
"That thing is just plain fast"
"If you go any faster, the authorities may get involved"
While our non-competetive riders tell us that their RailGun seat has brought new comfort and life to their riding, we would like to remind people that this seat is not really designed for comfort at low power levels, such as just cruising around. It is a performance seat, designed to provide proper support while under power and might possibly become a bit tedious otherwise. The lumbar support is designed to assist and support the lower back when it is under tension, whether for short sprints or 24 hr ultras. If you ride with your lower back relaxed and not under tension, this seat may not be the best choice for you.